Dog Poison is around more that you might think. Dog food poison is one of the symptoms dog illness, but there are many medications, chemicals and even foods that can harm your canines. In 2010 the USA saw more than 100,000 cases of dog poison. Many of these were caused by substances you have in your home so it is very important for the health of your dog that you are wary about what they are ingesting. Surprisingly, your house is full of poisons that can be fatal to your canine some of which are obviously not poisonous. Another dog poison are medicines that are beneficial to you, but can seriously harm your dog, and it is important that you keep all medicines well away from your dog. Medications that are anti-inflammatory (ibuprofen or naproxen)can be a serious hazard, and it can cause intestinal or stomach ulcers in your dog, as well as kidney failure. Antidepressants are another danger, and they can make your dog vomit violently or even experience seizures and elevated temperature, blood pressure and heart rate. Another drug to keep out of your dog's way is Isonaizid, and this tuberculosis drug can cause your dog to have seizures. 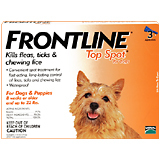 While you do need to keep your dog free of fleas and ticks , you need to be very careful with any medications you apply. If your dog takes too much of these substances, you may end up causing serious health problems depending on the medication. If you happen to get flea bites then go to our flea bites on humans page to see what they look like and how they can be treated. It is important to know if you or the dog of the family have been bitten by fleas because those bugs carry diseases. Depending on the type of poison you use in your house to kill rodents, your dog can have serious problems. Even if he eats a rat that has been killed by poison, you may begin to see serious symptoms of illness. Many drugs that are designed to help dogs end up harming or killing them thanks to their bodies reacting violently to the medicine. Be careful when applying any de-worming drugs or painkillers, as they have been known to cause serious problems in dogs. Bleach is one of the main household cleaners that can harm your dog, but many other strong detergents and cleansers are also hazardous to your dog if they are ingested. These cleansers will usually poison the dog, which can lead to respiratory tract and stomach issues. Your dog may poison himself just by licking paint from the ground, as paint contains a high lead content. Make sure to watch out if your dog takes a shine to batteries, linoleum, pennies, or anything else that may contain metals. Your dog's ingesting metals can lead to serious intestinal and neurological problems that may end up killing him. Any strong chemicals that you use around your house can kill your dog, and you should always make sure that pool chemicals, tile cleaning acids, paint thinner, antifreeze and other hazardous chemicals are well out of the dog's reach. Surprisingly, a number of different human foods can injure your dog. Chocolate is a dog food poison because it contains methylxanthines that may make your dog vomit . Chicken bones splinter, get lodged in your dog's throat, and choke or kill them. Avacados are another dog poison because they contain persin which cause vomiting and diaherra. Alcohol can cause respiratory problems in your dog when ingested, aside from the regular vomiting. Raisins and grapes can actually cause kidney failure in your dog.